Are Continuous Background Checks Mandatory? These post-hire screenings are meant to protect employers from negligent hiring claims and protect customers from violence or otherwise harmful behavior. Even if the employee had a clean record upon hire, anything could have happened in the months or years since their initial date of employment. Is Consent is Still Required? As with pre-employment background checks, consent and authorization is still a requirement prior to screening an employee. The employee must also be advised of the potential for adverse action, including pre-adverse action notification, and they should know their rights to dispute any inaccurate information. The employee can also withdraw consent to a background check at any time. If the employee gives consent to be screened at hire, and the employer plans to use rolling background checks, the employee must be aware that the consent form will be used for future reference. The form must be clear and concise when requesting authorization for future background checks. It is also advisable that employees renew their consent periodically. See also: Is it Time to Update Your Corporate Screening Policy? What is the Best Way to Implement the New Policy? As with any new HR policies, all current employees must be notified of the new continuous screening policy. A termination policy must be created in the case of any new background check information that reveals criminal records. The policy should also include a background check decision matrix for assessing any criminal activity that turns up on a screening. The EEOC requires consistency when reviewing criminal records and determining if they will disqualify an employee for a promotion or prompt termination. The new policy may provide guidance on what would prompt a background screening, if they aren't done on a regular basis. For instance, if an employee is changing jobs, if there was an accident, or if they are displaying unusual behavior, these may trigger the need for a new background investigation. The downside of rolling background checks is the potential of having negative information turn up for an otherwise good employee. 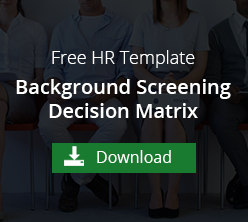 With the help of the background check decision matrix, management can decide if the new information is job-related or harmful to co-workers and the employee needs to be fired. Employers are trying to do a better job of creating a safe and equal workplace, and often that may mean facing some tough decisions on those that could be doing harm in not-so-obvious ways. To learn more about background checks and screening policies as they relate to particular jobs, download the free ebook below.